With mask limit testing PicoScope will highlight any parts of a waveform that fall outside the mask area. The highlighted details persist on the display, allowing the scope to catch intermittent glitches while you work on something else. The measurements window counts the number of failures, and can display other measurements and statistics at the same time. Numerical and/or graphical mask editors can be used to enter accurate mask specifications, modify existing masks, and import and export masks as files. 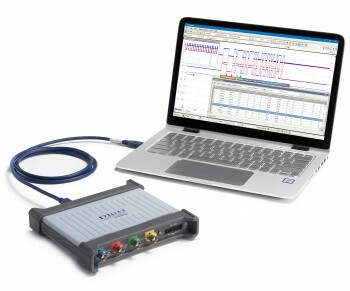 In addition to testing waveforms in the oscilloscope, mask limit testing can also be applied to the spectrum analyzer, allowing you automate finding problems in both the time and frequency domains. To use mask limit testing select Masks from the PicoScope Tools.